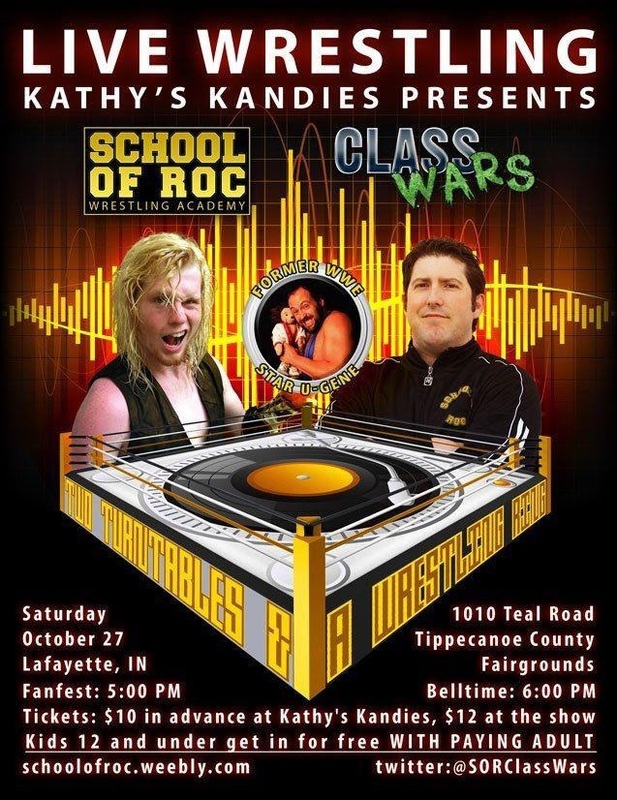 SOR: Class Wars make their big DEBUT in their home base on Saturday evening, October 27th at the Tippecanoe County Fairgrounds Coliseum (located at 1010 Teal Road) in Lafayette. The event, titled “Two Turntables & a Wrestling Ring”, will feature graduates of the School of Roc, under head trainer and nationally-recognized independent wrestling star Billy Roc (CHIKARA, IWA Mid-South), plus area veteran stars who have headlined wrestling events across the state for a number of years and an internationally-recognized professional wrestling star – whose name will be released in the coming weeks – in a featured bout. The stars of SOR: Class Wars were featured on the critically acclaimed Class Wars: Season One web series during the early months of 2012 and have been seen on events held in the past year by some of the brightest, nationally-known independent wrestling companies in America. “Two Turntables & a Wrestling Ring” will mark their live event return under the SOR: Class Wars brand for the first time since December 2011. SOR: Class Wars prides itself on being a family-friendly entertainment brand and will provide nothing but the highest quality of wrestling entertainment possible for kids of all ages at “Two Turntables & a Wrestling Ring”. MORE INFO ON THE SHOW CAN BE FOUND HERE~!